Home > News > How does a fine crusher break sticky material? How does a fine crusher break sticky material? As we all know, materials with viscosity and moisture content are prone to breakage and incomplete crushing during the crushing process, and the use of fine crusher overcomes this crushing problem. 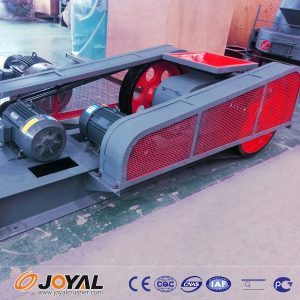 Shanghai Joyal Mining Machinery, as a manufacturer of ore crushing processing machinery and equipment, tells you why the fine crusher can do this, and can crush and process sticky materials. The viscous material itself has a certain toughness. In many crushing equipments, the tough material is different from the harder material during the crushing process. This is because the tough material is subjected to the crushing hammer. In the process, its own elastic structure will buffer a part of the impact force, reduce the crushing effect, resulting in the material is not broken completely and can not be broken. The fine crusher is designed for materials with higher hardness, which has a large difference in the amount of crushing, that is, it can break the material with higher hardness into the standard particle size, and whether it can also take advantage of this crushing effect. Is the viscous material crushing mill equipment into a standard particle size? The problem encountered in the process of crushing with viscous materials is that the elastic structure of the self-elastic structure has the effect of buffering force, and then it is easy to adhere to the inner wall of the crushing cavity due to its large viscosity during the crushing process, and the deformability is better. Strong, not conducive to the work of the crushing work, but also block the discharge port, in the face of two major fracture problems, how to solve the fine crusher? In view of the crushing problem of the viscous material itself having elastic structure, we can use the crushing ratio which is different in the fine crusher. The viscous material is difficult to be broken because the cohesive force existing inside it has elasticity, and the crushing ratio of the fine crusher can be completely Overcome the existence of this cohesive force and implement compulsive fragmentation. For easily adhering materials, it is possible to add dry materials for crushing at the time of crushing, which can play a role of drying, and can reduce the probability of the material adhering to the inner wall. Next: Which materials can be selected for the jaw plate of the jaw crusher?